It’s never been a secret that the GMC brand of trucks is one that has been considered a premium brand for us to drive and experience on a daily basis. The GMC Canyon is a midsize truck that stands out as a handsome performer that can be right for the drive you have to make every day. This truck shows up with a choice of bed sizes, cab configurations, affordable prices, and a few different powertrains to make it a truck that can be easy for you to find the right model for your driving needs. If you’re not fond of the idea of a full-size truck and want something smaller and more efficient but still need a truck, the GMC Canyon is the right one for you. Take a look at this gorgeous truck and let the power, features, size, and efficiency make a difference in your life. This truck is built with premium qualities to make it the truck that feels right and looks exactly the way you want a truck to be for you. Visit your nearby GMC dealership and you’re going to be able to enjoy the drive in the Canyon you see there. When you see the GMC dealership to take a look at the Canyon and learn what it has to offer, you’re going to find out this is a truck that brings you an upgraded interior in the All Terrain model with the addition of Jet Black leather front seats that have Cobalt Red stitching. There is now a washer fluid level sensor that’s included as standard equipment for every model of the Canyon in order to let you have the ability to understand what’s available for the drive. These upgrades can make it easy for you to have the drive you’re looking for. As you check out the GMC Canyon you’re going to notice a large number of impressive items that make this a truck that can be the choice you want to make for your drive. This is a truck that comes standard with a 4.2-inch screen, a six-speaker audio system, power windows and locks, a power driver seat, a rearview camera, the CornerStep rear bumper, cargo box lighting, and a locking tailgate. The SLE trim adds an eight-inch touchscreen, cruise control, rear defogger, remote keyless entry, steering wheel audio controls, fog lights, 17-inch wheels, and several convenience items. Moving to the SLT and the Denali models you’re going to have the benefits of additional comfort items and automatic climate controls, a remote start system, heated front seats, a rear sliding window, and 18-inch wheels for the drive. The other options you can choose for this truck is a long list. You can enjoy the benefits of the Convenience Package, the SLE Convenience Package, the All Terrain Package, and the Driver Alert Package. These different packages allow you to have 4WD systems, a Bose premium seven-speaker audio system, choices of wheels and tires, several off-road and adventure items, and racks that can allow you to carry canoes or surfboards with you on the road. The GMC Canyon is a midsize pickup truck that gives you three different engines for the drive you’re looking for. The base engine is a 2.5-liter four-cylinder model that offers 200 horsepower and 191 lb.-ft. of torque. Move up to the middle engine and you have a 3.6-liter V6 with 308 horsepower and 275 lb.-ft. of torque. At the most powerful model you see a 2.8-liter turbodiesel four-cylinder engine with 181 horsepower and 369 lb.-ft. of torque for the power and efficiency you want. 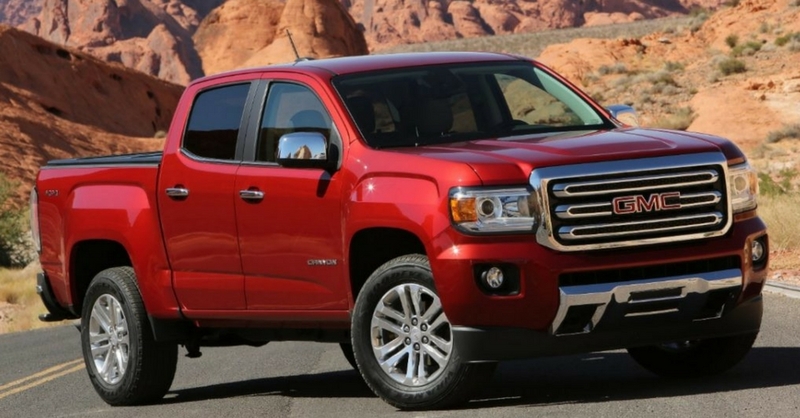 If a midsize pickup truck is the right choice for you, the GMC Canyon is worth a look. This truck has a long list of impressive items you can have for the drive you want to make on the road and the qualities you’ll be ready to enjoy. Take a look at this amazing truck and let it become the one you’re looking for and you’ll be ready to head out to handle the truck stuff you want to get done on the roads and trails in your area.